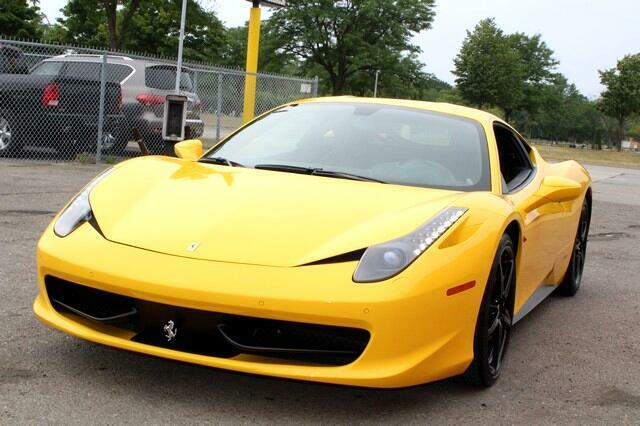 Finished in a Giallo Modena (Yellow) Exterior and Nero (Black) Leather Interior, this 458 Italia is simply outstanding! This Ferrari has been very well maintained, recently serviced, and with only 10061 miles, it is in pristine condition! In addition to its luxurious standard factory equipment, this 458 Italia boasts an extensive list of options that includes, CARBON FIBER STEERING WHEEL W/ LED S, POWERED DAYTONA STYLE SEATS, CARBON FIBER DASHBOARD INSERTS, Leather Interior, AFS System, Yellow Brake Calipers, Suspension Lifter, Radio, Navigation System w/ Bluetooth, Parking Camera, Front Rear Parking Sensors, Sport Sill Cover, Yellow Rev Counter, 20 Inch Michelin Pilot Sport Forged Diamond Wheels, Giallo (Yellow) Special Stitching, Tire Pressure Measurement and much more! The 458 Italia is critically acclaimed for its screaming performance, world-class handling, and brilliant transmission. Brembo 4-wheel vented disc brakes, Dual stainless steel exhaust w/polished tailpipes, Front rear independent active, adjustable self-leveling suspension-inc: magnetic fluid-filled shocks, front rear stabilizer bars, Rear limited slip differential, Variable electric-assist pwr steering This particular car features a stylish carbon driving zone with LED s, upgraded seating accommodations, and unique carbon fiber dashboard inserts, making this a great buy. Take advantage of this opportunity!! Message: Thought you might be interested in this 2011 Ferrari 458 Italia.